At Magnum Contracting Group we have built a reputation in Long Island as a first rate construction company that homeowners can trust to provide superior work at competitive rates. We offer Brookville roofing and remodeling services, fire restoration services, home extension construction, and siding installation. We work very closely with each of our clients in order to ensure that every detail of the job is done to your satisfaction. Contact us today and let us help you launch your next home improvement project. If you live in a Brookville house that is more than a couple of decades old and your roof has never been properly inspected, it's time now to get it done. As a roof ages, it begins to show signs of wear and tear. The most notable symptoms are warped edges, separated boards, missing shingles, discoloration, and loose connections. We offer a thorough roof inspection of your Brookville roof that covers all components. We offer comprehensive roof repair on all types of roofing systems. Our goal is to fully restore this structure back to the best condition in order to provide you and your family with the ultimate protection. We follow a step-by-step process to assess the weaknesses of your roof and then can take care of the repairs. We work with your insurance company if there is a claim involved. It's good to know you have an advocate on your side to help you ensure you get the repairs you need for a strong and reliable roof structure. One of the most important investments you'll ever make into your home is remodeling the interior. We offer kitchen, bathroom, and basement remodeling services as well as any other room in your Brookville home. If you need additional space, we can construct an extension as well. We take care of the interior and exterior construction to add onto your home. It all begins with an initial consultation in which we help you with your floor plan adding each component in order to create a perform room design for you. This includes flooring, walls, countertops or cabinets, appliances, and accessories. As a Bohemia remodeling contractor, you can feel confident that we can build you the room you've always wanted. 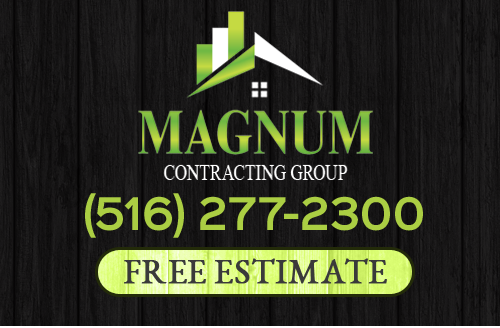 If you need roofing or remodeling services in Brookville, NY, give Magnum Contracting Group a call today at 516-277-2300 or complete our online request form. Following damage to my home from a storm, Magnum came in and redid the entire exterior. The work is clean and looks awesome. Definitely will use them again. Our bathroom looks great! We love the new look and your suggestions really panned out well. We appreciate the clean professional work. We will let you know when we are ready for the next project.